Last week, students in the School of Drama noticed something different about the lobby of the Purnell Center for the Arts: The large painting that hangs over the lobby’s lower stairwell was marked with a set of initials in the lower right-hand corner. This isn’t the first time the painting has been marked. 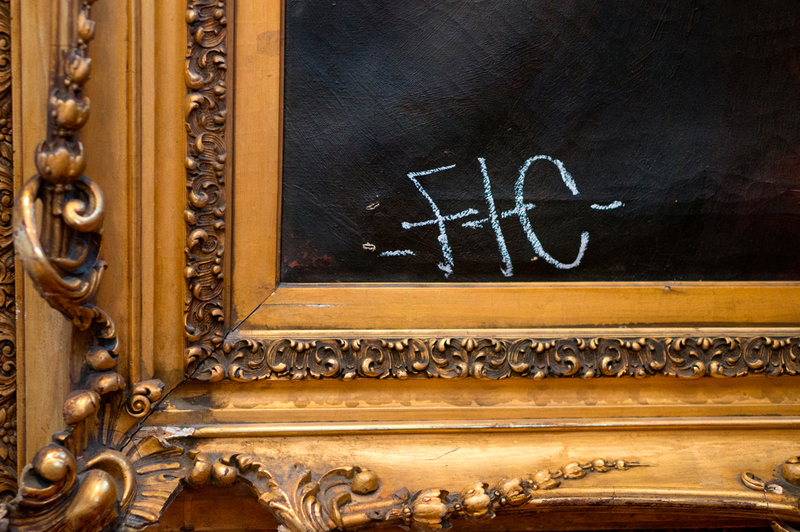 According to Jonathan Ward, the properties master of the School of Drama, the painting was first defaced about a year ago, when someone wrote the initials “FTC” in the lower left-hand corner in what looks like white crayon or oil pastel. 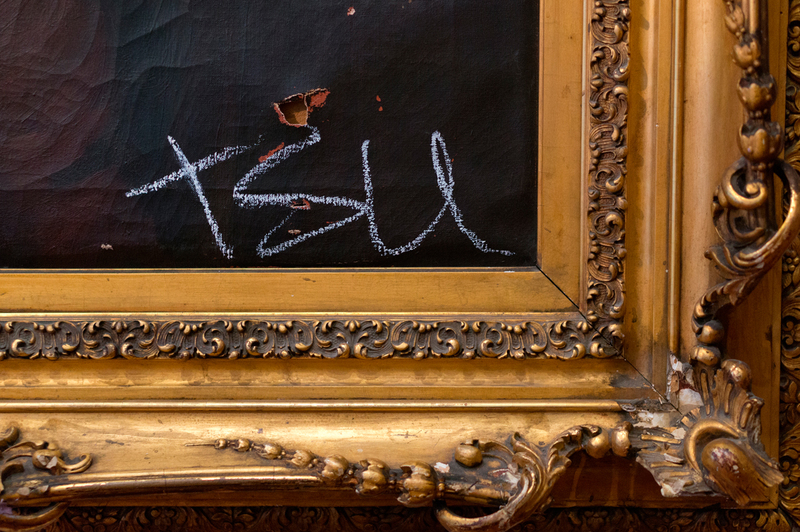 The most recent initials, “TSU,” appeared just last week. Although the provenance of the large painting is murky, Ward thinks that it was given as a gift to the School of Drama when the school was founded in 1914. The portrait was painted by Louis Kronberg, a Boston native who has other works hanging in the Philadelphia Academy Charter School and New York’s Metropolitan Museum of Art. 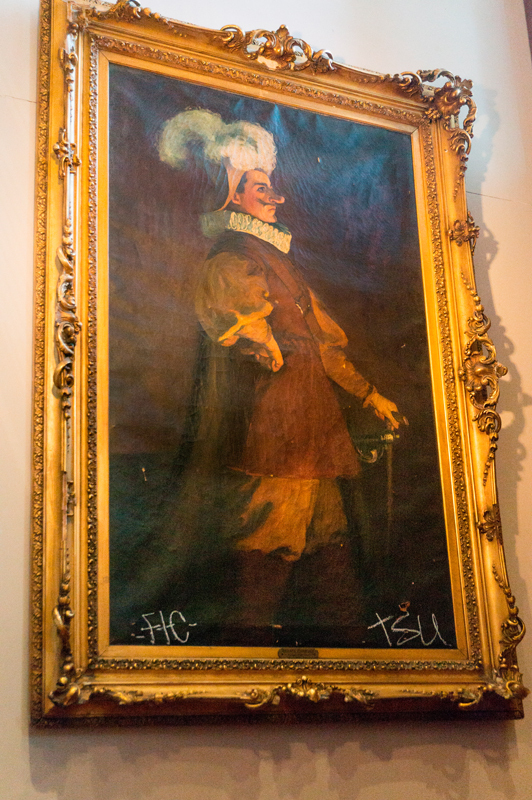 The subject of the painting is Richard Mansfield, a European actor, in his role of Cyrano de Bergerac in the eponymous play, which he performed on Broadway in 1898 and 1899. Ward estimated that Kronberg painted the portrait around the turn of the 19th century. Ward found the painting in the School of Drama’s storage warehouse about four years ago, and learned that it used to be on display in the Dean’s Office of the School of Drama. Ward decided to bring the portrait back to life in the Purnell Center for the Arts lobby, and even uses it as part of his stagecraft props class — he teaches students to repair the chips and fractures in the painting’s elaborate gilded frame. When Ward saw the most recent graffiti tag on the painting, he contacted University Police, as well as University Archives, which informed him that the painting is not part of Carnegie Mellon’s artistic property collection, and belongs to the School of Drama alone. According to University Police, the investigation of this incident is ongoing. The Carnegie Mellon Police Department is working with the Pittsburgh Police Department, which has a dedicated graffiti task force, and the Port Authority Police, which also has an extensive graffiti investigative department. Ward noted that he had seen the tag “TSU” in other places around Pittsburgh. Students and faculty alike are dismayed and shocked that someone would deface the 100-year-old work of art. “It makes me really sad and upset that someone would vandalize something so beautiful,” Ward said. Ward said that the next step is to restore the painting. Although Ward lacks the experience to restore the painting himself, he has contacted the Carnegie Museum of Art’s restoration department and hopes to restore the painting with their help.